Any dish I prepare with left over idlis makes my stomach happy. 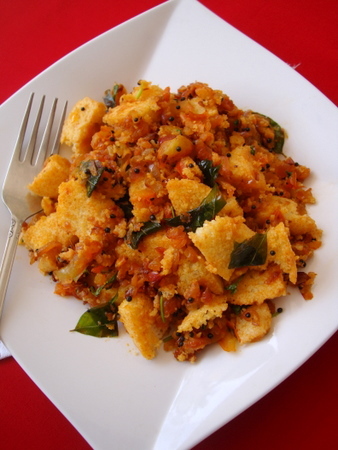 Masala Idli is a favorite and takes me less than 15 minutes to prepare. Usually prepared as a breakfast fare with a good dose of lemon juice and fresh coriander as garnish. Lively, invigorating flavors! 1 Heat oil in a cooking vessel, add the mustard seeds and let them splutter. Add the curry leaves and saute till a nice aroma emanates the kitchen. 2 Add the green chilies and ginger and saute for few secs. 3 Add the chopped onions and saute on medium heat for 3-4 mts. Add turmeric pwd, red chili pwd, coriander pwd, saunf pwd and garam masala pwd. Mix well. 4 Add the chopped tomatoes and saute for 5 mts till oil separates. 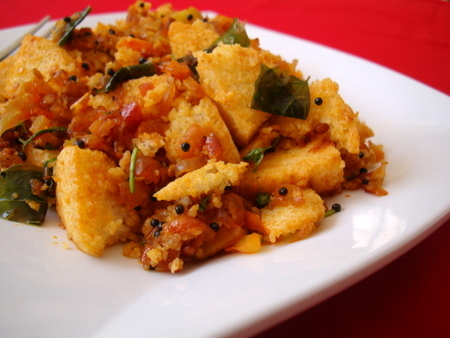 Add the crumbled idlis and mix. Saute for 2 mts. Add lemon juice and mix. Turn off heat. 5 Garnish with chopped coriander leaves. Serve warm. Sailu, your stomach is happy and I am as well. I am not a big fan of idlis and prefer to spice them up. Thanks for the recipe. Hi Sailu..I have subscribed to your site for updates and I think still you didnt approve my request…Kindly check. Can you please subscribe again? I do not manually approve the subscriptions. Its automated. You will receive an email asking you to re-confirm the subscription and once you accept the link, you are automatically subscribed and you will receive updates to you email. God Sailu this looks so tempting cant wait to try !! I’ll happily have this masala idli anytime, delicious and marvellous..
Big fan of your work!! Can you (some time in future) please post a photo tutorial on making Rasgullas. I live in the US and hate store bought Rasgullas. I know there are like a million recipes on the web, but somehow I’d rather do it your way 🙂 I’ve never cooked all my life, and now, thanks to you and a couple of other blogs, I’m branded a ‘natural cook’. Keep up the amazing work. Glad to note your branded a natural cook. 🙂 I have blogged Rasgulla – Rasmalai recipe earlier. Have a look. This is a nice little trick for spicing up leftovers. One of my aunts used to do this with left-over dhokla! i do similar recipe with leftovers.. nice addition of fennel! All your recipes are very nice and i try almost every recipe at home and my husband likes them very much. thanks for posting a wonderful recipe. I am so happy…!!! everyday I am Cooking One or Other Receipe and Am Showered with Wonderful Blessing from my Parents…. That makes Me feel like Heaven… Thats All Coz of You… Love You!!!! oh my god!!!! i guess i started luvin idli….thx sailu…by de way i hav tried one of ur egg curry ystrdy….suprb…. It looks great and it’s easy to make. I think I’ll make it. 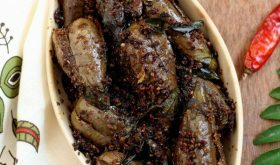 hi sailaja garu…..nenu mee dishes chala varaku try chesanu…..they turned out to be really good….u actually inspired me…..even i tried this one today at home….and itz a huge hit……thank u sooo much….. The best masala idly recipe ever! Here I am in Brisbane Australia with some left over idlis after only a few minutes I have a tasty and delicious dish. Thank You.